As an artist in the Low Country, I am fortunate to live in the vibrant arts community of Charleston, SC. Between the Art Guilds of Mt. Pleasant and Charleston, I have the privilege of painting with outstanding artists—all of us drawn to the beauty of a natural landscape encompassing expansive marshes, seascapes, coastal waterways and historic sites from plantation homes and gardens to the exquisitely preserved streets of historic Charleston. For the most part, my study of painting and drawing has been independent, outside traditional university or art academy settings. 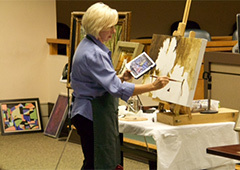 When I came back to the world of painting after my career in communications and public relations, I studied watercolor at various workshops and classes in Oregon and North Carolina. However, it wasn’t until I studied oil painting with artist Chris DiDomizio in his Old World Art studio in Atlanta that I began to see a transformation of my work. It was this life-changing decision that helped me improve and grow as an artist. DiDomizio, a classically trained artist who studied in Italy, makes every student (every single one) go back to the basics of drawing. Every person has to start from the beginning, drawing cubes, learning values all over again and progressing to the point of copying fine art drawings. Only when deemed ready, can the student pick up the brush and paint in oils. From then on, we learned to paint in oils by copying Master artists’ paintings, with a special emphasis on the paintings of John Singer Sargent. It was in this studio that I learned the basics of portrait painting, too. In addition to DiDomizio’s Old World Art school, two other artists have made a tremendous impact on my development as an artist. I studied portrait painting with painter Paul W. McCormack of the Hudson Valley, New York. 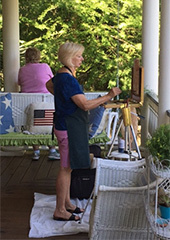 Over the past few years, I started painting en plein air and studied with Bill Davidson of Johns Creek, Georgia. 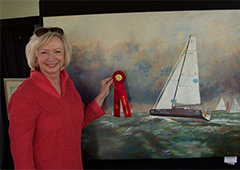 Davidson is a Signature Member of the Oil Painters of America and has exhibited his work nationally. See, now they are done. the pictures never want to end. As time unwinds or youth unbends. "Come in, come in, come in." While most of my earlier paintings were in watercolor, today I work mainly in oils with a strong interest in portraits and landscapes. For some reason, I've especially enjoyed painting portraits of the extremes in age—older people with their wisdom-lined faces and young children with their youth and innocence. There’s nothing as exciting as painting a face, adding more and more detail until the eyes open, the expression is matched and the person emerges, ready to draw breath. I also paint landscapes en plein air, which is a whole different mental process: editing the landscape down to a compelling composition; adding elements for clarity; deleting extra details that detract from the focal point; painting against time, the elements and changing light. Occasionally I’ll work out an abstract painting for exercise in thinking about pure shapes, lines, values and color. This seems to take an entirely different part of the brain and I find abstraction an interesting and challenging process.Sometimes I also come back to the tradition of still life painting and enjoy composing vignettes and playing with light and shadow. Studied watercolor painting with Oregon artists Patrick Dooley, Ellen Gabehart and Richard Quigley and with North Carolina artist Luna Lee Ray. In Atlanta, studied drawing and oil painting at Old World Art with the national award-winning and internationally trained artist Chris diDomizio.